The Lapdogs received B's Brand Blueberry Crisps and Cranberry Crisps from Wag Tail Farm for review and boy was this box difficult to get into the house! The smell coming from the box was amazing, even to the human's nose. 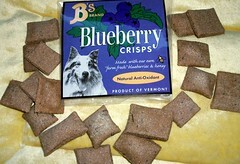 The folks at Wag Tail Farm began baking B's Brand Blueberry Crisps for their own dogs, using berries and honey from their apple and blueberry farm in Vermont. The crisps are made from wholesome human grade ingredients. Whole wheat flour, blueberries, water, honey, canola oil, cinnamon, vanilla and eggs are all that you'll find in the simply delish smelling B's Brand Blueberry Crisps. The Cranberry Crisps are the newest treat from Wag Tail Farm. 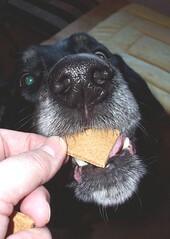 Just like the Blueberry Crisps, they too are a healthy, low fat, all natural treat that you can feel good about feeding to your dogs. Both varieties are even kosher! The crisps are hand cut, which adds a nice simplistic homemade touch. I can't state enough how amazing they smell (when will they invent smell-o-net? ), but what I love even more is how you can see the blueberries and cranberries baked right into the treats. 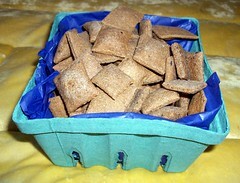 Both varieties of treats are available in a 10 oz bag or berry basket, as well as a 1 lb tin. Currently they are not available to order directly from Wag Tail Farm, but are available at a number of retailers, which you can find listed on their website. A number of them do have the options for ordering online. Both of the varieties of Wag Tail Farms crisps received the Lapdogs official 16 Paws Up Seal of Approval, as well as the Mom seal of approval! 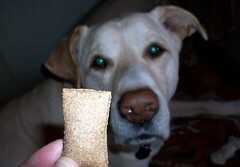 All four go nutso when I take these treats out and I really feel great about feeding these to them! They are Made in the USA, 100% wholesome and oh yea, did I mention how delish they smell? Order some for your pack now - neither you or they will be disappointed! Looks like they were pretty well behaved Lapdogs! I'll bet that basket didn't last long. Look quite tasty. Such good dogs waiting patiently for their treats. We'll have to check them out. 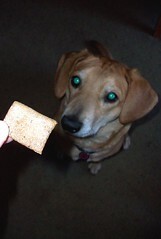 I'm always looking for blueberry treats for the pooches.